The modern history of Muslims in Germany dates back to the 1930s when Adolph Hitler rose to power, helped Muslims grow the Muslim Brotherhood in the Middle East, and militarized Muslims into two of Germany's 38 Waffen-SS Divisions (see Hitler Islam). Muslims fought for Germany during the Second World War but few of them fought in or settled in Germany after the war. In the late 1940s, Muslims in Germany still numbered only a few thousand (see Sharia law in Europe). Things changed dramatically after 1961, however, when West Germany, short of men and in need of cheap labor to drive its industrial growth, opened its gates to guest workers from Turkey. Many of the Muslims who came to work settled in Germany and reproduced at a higher rate than the Germans. 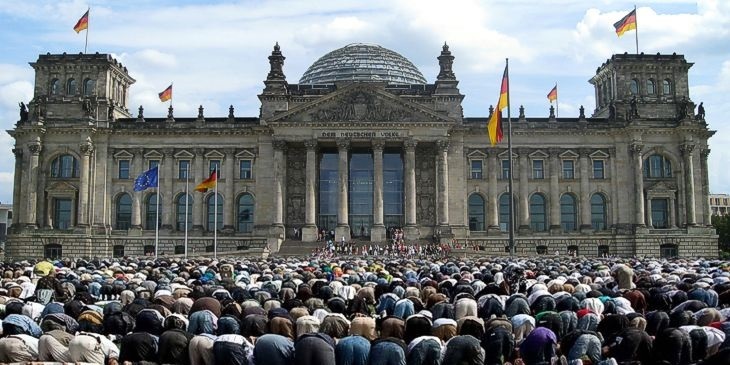 Today, the official number of Muslims in Germany exceeds six million, of whom four million are not German citizens. The unofficial numbers are higher and both numbers will increase as Germany continues to accept large numbers of Muslim refugees. How is Germany dealing with the rise of Islam within its borders? The greatest fear of a German is being called a racist or a neo-Nazi. Gripped by this fear, the Germans are avoiding the eerie similarities between Islam and Nazism (see below) and repeating their catastrophic error of letting fascism grow unopposed.